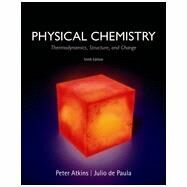 Edition after edition, Atkins and de Paula's #1 bestseller remains the most contemporary, most effective full-length textbook for courses covering thermodynamics in the first semester and quantum mechanics in the second semester. Its molecular view of physical chemistry, contemporary applications, student friendly pedagogy, and strong problem-solving emphasis make it particularly well-suited for pre-meds, engineers, physics, and chemistry students. Now organized into briefer, more manageable topics, and featuring additional applications and mathematical guidance, the new edition helps students learn more effectively, while allowing instructors to teach the way they want. Peter Atkins is a fellow of Lincoln College in the University of Oxford and the author of about 70 books for students and a general audience. His texts are market leaders around the globe. A frequent lecturer in the United States and throughout the world, he has held visiting professor­ships in France, Israel, Japan, China, and New Zealand. He was the founding chairman of the Committee on Chemistry Education of the International Union of Pure and Applied Chemistry and was a member of IUPAC’s Physical and Biophysical Chemistry Division. Julio de Paula is a Professor of Chemistry at Lewis and Clark College. A native of Brazil, Professor de paula received a B.A. degree in chemistry from Rutgers, The State University of New Jersey, and a Ph.D. in biophysical chemistry from Yale University. His research activities encompass the areas of molecular spectroscopy, biophysical chemistry, and nanoscience. He has taught courses in general chemistry, physical chemistry, biophysical chemistry, instrumental analysis and writing.